Being one of the lightest and compact macro lens in the market , the Canon EF-M 28mm F3.5 Macro IS STM of just under 2-inches long can produce sharp images with incredible detail and small images. World's first lens with a built-in Macro lite, when enabled, the Canon EF-M 28mm F3.5 is able to supply light to your photos to provide a better sense of depth and dimension. 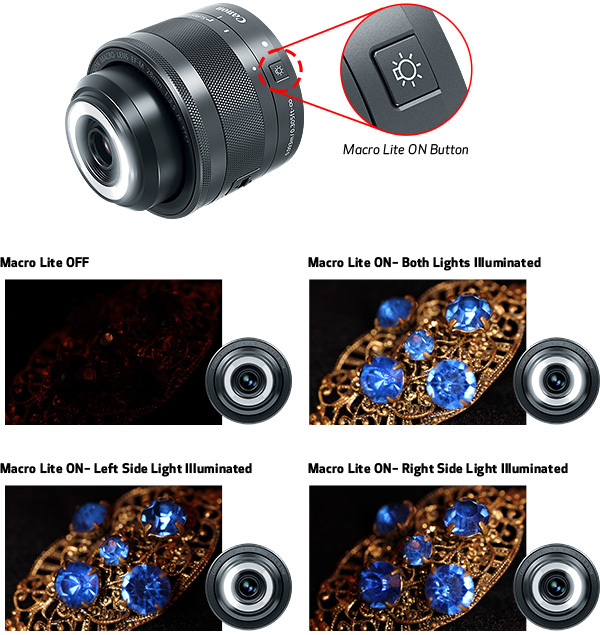 LEDs are integrated into the front of the lens allowing a range of illuminating possibilities. Setting lights from both sides for maximum brightness can reveal more detail of your subjects. Hybrid IS system helps minimize blurring in images due to small movements especially when taking handheld photographs. Take photos and record videos in a smooth and quiet operation with STM as it ensures fast autofocusing in silence.